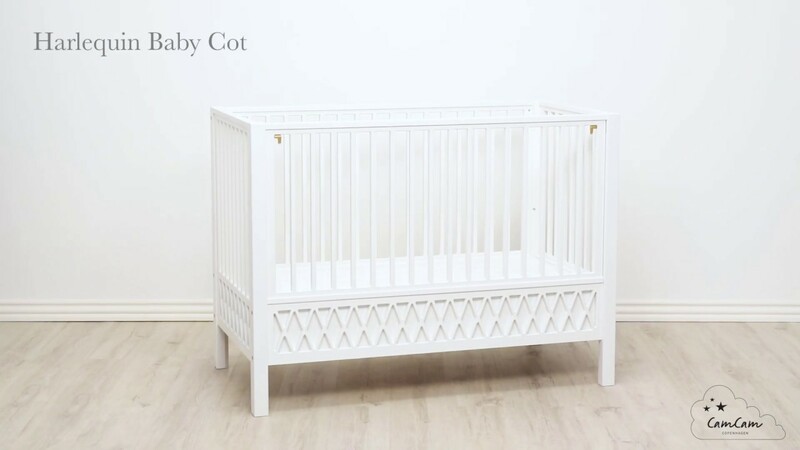 Pairing traditional details with contemporary Scandinavian styles, the Cam Cam Copenhagen Harlequin Cot Bed will look oh-so precious in the nursery. Featuring an adjustable wooden frame, raise and lower the bed base to suit your little one's needs. With 3 height settings, tend to your newborn without hurting your back and once they've started to find their feet, lower the mattress and stop quick escapes! Including childproof push-button locks; quickly and easily remove the side when changing bedding and later transform the gorgeous frame from a cot into a toddler or day bed. Finished in a choice of colours with a matching wardrobe and changing table available, all featuring the Harlequin diamond pattern, style this gorgeous collection with coordinating accessories and toys to create a cosy retreat for counting sheep! Pair with other designs from the Harlequin collection! In need of Nursery Storage? See our selection here!